The most common sign of melanoma is the appearance of a new mole or a change in an existing mole. This can occur anywhere on the body, but the most commonly affected areas are the back in men and the legs in women. Melanomas are uncommon in areas which are protected from sun exposure, such as the buttocks and the scalp. In most cases, melanomas have an irregular shape and are more than one colour. The mole may also be larger than normal and can sometimes be itchy or bleed. Look out for a mole which changes progressively in shape, size and/or colour. Read more about the symptoms of melanoma. These pages mainly cover superficial spreading melanoma, the most common type. Other types of melanoma are also summarised below. Around seven out of 10 (70%) of all melanomas in the UK are superficial spreading melanomas. They're more common in people with pale skin and freckles, and much less common in darker skinned people. They initially tend to grow outwards rather than downwards, so don't pose a problem. However, if they grow downwards into the deeper layers of skin, they can spread to other parts of the body. Therefore, you should see your GP if you have a mole that's getting bigger, particularly if it has an irregular edge. Nodular melanomas are a faster-developing type of melanoma that can quickly grow downwards into the deeper layers of skin if not removed. 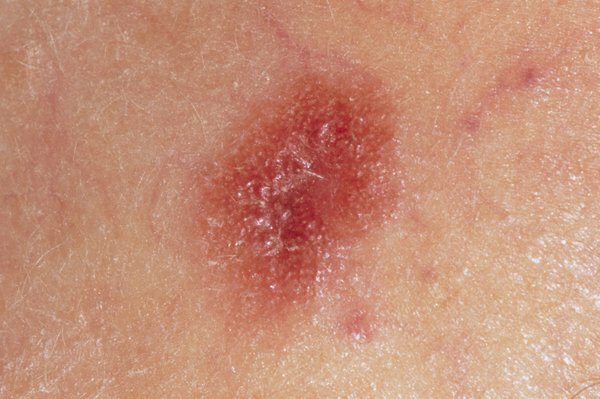 Nodular melanomas usually appear as a changing lump on the skin which might be black to red in colour. They often grow on previously normal skin and most commonly occur on the head and neck, chest or back. Bleeding or oozing is a common symptom. Around one in 10 melanomas (10%) are lentigo maligna melanomas. They most commonly affect older people, particularly those who've spent a lot of time outdoors. They develop slowly over a number of years and appear in areas that are often exposed to the sun, such as the face. To start with, lentigo maligna melanomas are flat and develop sideways in the surface layers of skin. They look like a freckle but they're usually larger, darker and stand out more than a normal freckle. They can gradually get bigger and may change shape. At a later stage, they may grow downwards into the deeper layers of skin and can form lumps (nodules). Acral lentiginous melanomas are a rare type of melanoma that usually occur on the palms of the hands and soles of the feet. They can also sometimes develop around a nail, most commonly the thumbnail or big toenail. Acral lentiginous melanomas are the most common type of melanoma in people with dark skin, but they can occur in people with any skin type. Amelanotic melanomas are also rare, accounting for about 5 in 100 melanomas (5%). They usually have little or no colour, but may occasionally be pink or red, or have light brown or grey edges. Cancer Research UK has more information about the different types of melanoma. Melanoma is caused by skin cells that begin to develop abnormally. Exposure to ultraviolet (UV) light from the sun is thought to cause most melanomas, but there's evidence to suggest that some may result from sunbed exposure. The type of sun exposure that causes melanoma is sudden intense exposure – for example, while on holiday, which leads to sunburn. Read more about the causes of melanoma. Excluding non-melanoma, melanoma is the fifth most common cancer in the UK. Around 13,500 new cases of melanoma are diagnosed each year. More than a quarter of skin cancer cases are diagnosed in people under 50, which is unusually early compared to most other types of cancer. Over recent years, skin cancer has become much more common in the UK. This is thought to be the result of increased exposure to intense sunlight while on holiday abroad. More than 2,000 people die every year in the UK from melanoma. See your GP if you notice any change to your moles. They'll refer you to a specialist clinic or hospital if they think you have melanoma. In most cases, a suspicious mole will be surgically removed and closely examined to see whether it's cancerous. This is known as a biopsy. A biopsy usually involves removing a small tissue sample. However, in cases of melanoma, the whole thing is usually removed from the beginning. You may also have a test to check if melanoma has spread to the lymph glands (nodes). This is known as a sentinel node biopsy. Read more about diagnosing melanoma. The main treatment for melanoma is surgery, although your treatment will depend on your circumstances. If melanoma is diagnosed and treated at an early stage, surgery is usually successful. If melanoma isn't diagnosed until an advanced stage, treatment is mainly used to slow the spread of the cancer and reduce symptoms. This usually involves medicines that target specific genetic changes in the melanoma, such as BRAF inhibitors, or medicines that boost the body's immune responses to the melanoma (so-called checkpoint therapies). Read more about treating melanoma. Once you've had melanoma, there's a chance it may return. This risk is increased if your cancer was more advanced or widespread. If your cancer team feels there's a significant risk of your melanoma returning, you'll need regular check-ups to monitor your health. You'll also be taught how to examine your skin and lymph nodes to help detect melanoma if it returns. Melanoma isn't always preventable, but you can reduce your chances of developing it by avoiding getting sunburned (even going pink in the sun). Most people get burnt while abroad on holiday or in the UK in the summer while doing outdoor activities, such as gardening, sunbathing or playing cricket. On these occasions you need to be really careful, particularly if you have pale skin and many moles. You can help protect yourself from sun damage by using sunscreen and dressing sensibly in the sun. Sunbeds and sunlamps should be avoided. Regularly checking your skin can help lead to an early diagnosis and increase your chances of successful treatment.